Sideshow Eatery is located near the corner of SW 9th and Washington in downtown Portland, Oregon. I first learned about this cart after Brett wrote a great article for Food Carts Portland in August. With a certain item on this particular menu, I had to make a special visit ASAP. Jason, the owner of this cart, started his menu with pommes frites, a.k.a. Belgian fries, which are fried twice to produce this amazing golden brown color. Each fry has that crispy exterior, exactly how I want them. 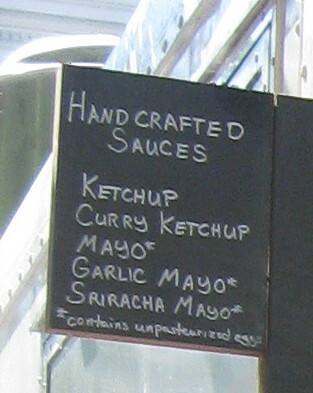 Here, Jason also does his own sauces, and that includes the ketchup. Choices at the time of my visit included ketchup, curry ketchup, mayo, garlic mayo, and sriracha mayo. The latter two are the most popular at the moment, but honestly, they all sound great. My initial visit was for the poutine, a Canadian comfort food with fries, gravy, and cheese curds. The curds here are orange in color to go along with a light-colored gravy. For $7, I received a healthy portion of the pommes frites, a ladle of gravy, and the curds on top. But wait! Add bacon for $1 more. Um, yes. No need to ask. Top-notch execution on every component. Among the crispy fries were some extra crunchy smaller ones that took me back to when I was a small kid addicted to those small extra crispy McDonald's fries. I won't dare compare the two, because Sideshow's frites destroy McDonald's any day of the week. Thank God I opened my eyes and started supporting small businesses instead. Bacon. I shouldn't need to say any more than that, but I will. The meat crack here is finely minced, a generous portion scattered on top of the frites and curds. Extra protein, fat, and sodium for my panda diet. Hell flippin' yes. The gravy is the glue that brings everything together, much like how the gravy on a Loco Moco brings that dish full circle. My friend and I raved over this poutine like uber giddy pandas. I'm sure a few expletives were echoed in public, but neither of us cared. I only wish I could have had someone else drive me home so I could enjoy my food coma. A few thoughts: I'd add a couple of overeasy eggs and some sriracha (just the rooster sauce) to my poutine and I'd probably never leave. I'm sure any of Jason's homemade sauces listed above would work here. While I could see this dish being too salty for people (I made sure to have a lot of water for dinner), I'd rather have that than some bland dish. Reading some comments on the Food Carts Portland article, one in particular stuck out. A person from Quebec said this poutine was the best outside the province. I'd say that's one amazing compliment! Jason started serving sandwiches at the beginning of September. The seared pork belly sandwich ($8) simply includes arugula, sriracha mayo, and pickled red plums on a Pearl Bakery baguette. The pork belly is flat out awesome, juicy and tender. While I'm not a big fan of chewy bread, I'd just ask for the bread to be toasted up next time. The bite of the arugula and the pickled red plums work well here. Sriracha mayo? I'm not a big mayo guy, but sriracha makes it an auto win. If you're in the mood for something else, the Caprese sandwich ($7) has heirloom tomatoes, basil mayo, and mozzarella on the Pearl Bakery baguette. For kids and adults, try the PB&J ($4), featuring whole grain bread, homemade peach jam, and homemade peanut butter. Yeah, even the damn jam and peanut butter are made from scratch. Much respect there. This cart accepts credit cards and is also open seven days a week!